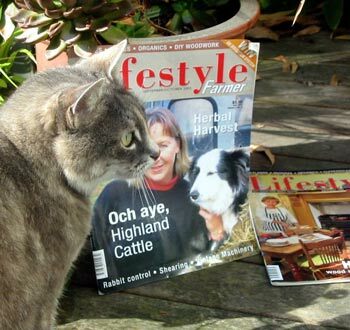 Lifestyle Farmer is a more specialised magazine for farms - though the emphasis is still on smaller holdings, and the diversity of crops and animals that might suit a more personal style of farm management. All the writers are enjoyable and entertaining, and the farming information given has exactly the right level of explanation needed. Issues include the growing of tree crops like walnuts and hazelnuts, the raising of highland cattle and miniature donkeys, restoring old tractors, to name but a few topics of interest. Mooseys has just planted out a hazelnut tree orchard. We found some well written articles about growing these nuts as a crop. Many alternatives for your land production are explored in depth, without commercial bias. And you'll still get good advice on running some hens, or shearing the sheep, or planting shelter belts to foil the New Zealand wind. This is also a very woman-friendly (and cat-friendly) magazine. And I like the organic environmental feel it has.